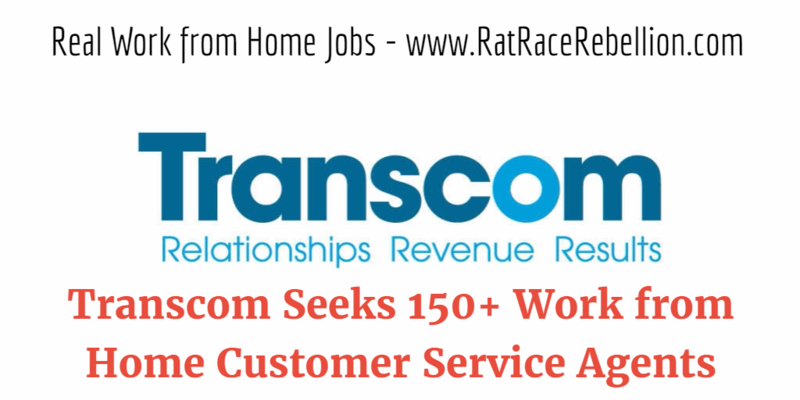 Transcom seeks 150+ work from home Tech Support Customer Service Agents. (The job isn’t featured on their site. See below for details on the position and the link to apply.) The company hires from most states, and hires employees (with benefits) rather than independent contractors. It employs 30,000 people in 21 countries. Shifts include evenings, weekends, split shifts and holidays. The jobs are full-time. Benefits include medical, dental and vision. • Quiet work environment without any conflicting responsibilities during your scheduled work shift. • Flexibility to work assigned split shifts between the hours of 7:00 a.m. CST and 10:30 p.m. CST including weekends, holidays with the possibility to flex up or down hours depending upon business needs. Transcom is hiring from AL, AR, AZ, CO, FL, GA, IA, ID, IL, IN, KS, KY, LA, MI, MN, MO, NC, ND, NE, NH, NM, NV, OH, OK, PA, SC, SD, TN, TX, UT, WA and WI. To apply for the job, click here. (The company’s link works best in Chrome, but may have issues in other browsers.) For more on Transcom, click here. This entry was posted in Tech Support, Work at Home Jobs and tagged Transcom. Bookmark the permalink.